If you’ve ever lived in a student flat/most rentals, you’ll know how un-appealing they are. Why do landlords think there is nothing sexier than a brown carpet? Our current flat is in a lovely location and has a lot of potential but thanks to the aforementioned brown carpet, darkness thanks to the single window facing north, an abundance of Ikea furniture and a very fetching purple and black curtain, it’s not so cute. I wish to god I could rip up the carpet and see the floorboards underneath, get rid of the ugly blind and replace a couple of bits of furniture. But mucking around with interiors is one of my favourite things to do in my spare time so despite the dire beginnings, I’ve worked my little space into something I’m kind of proud of. 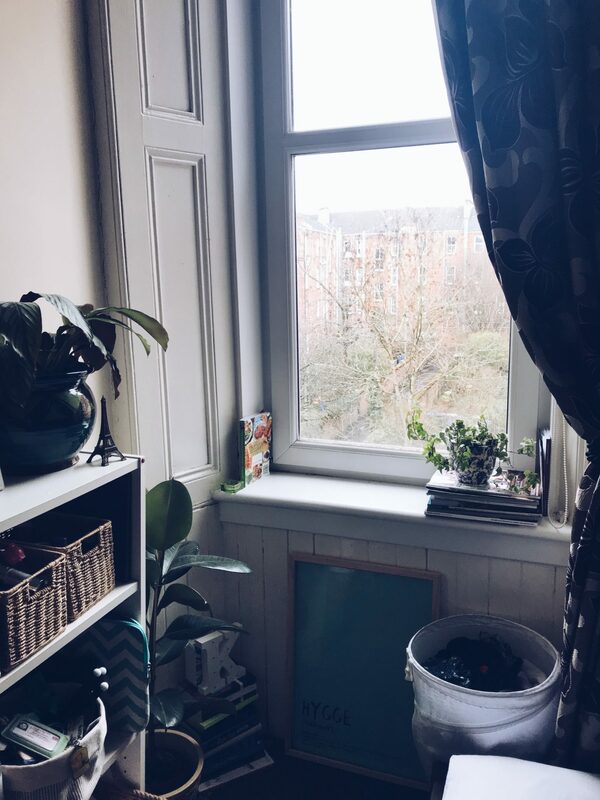 I wanted to chat and share some tips in case you also live in a hell hole* but want to spruce up your space. The bedrooms in our flat are very varied with mine being the tiniest. 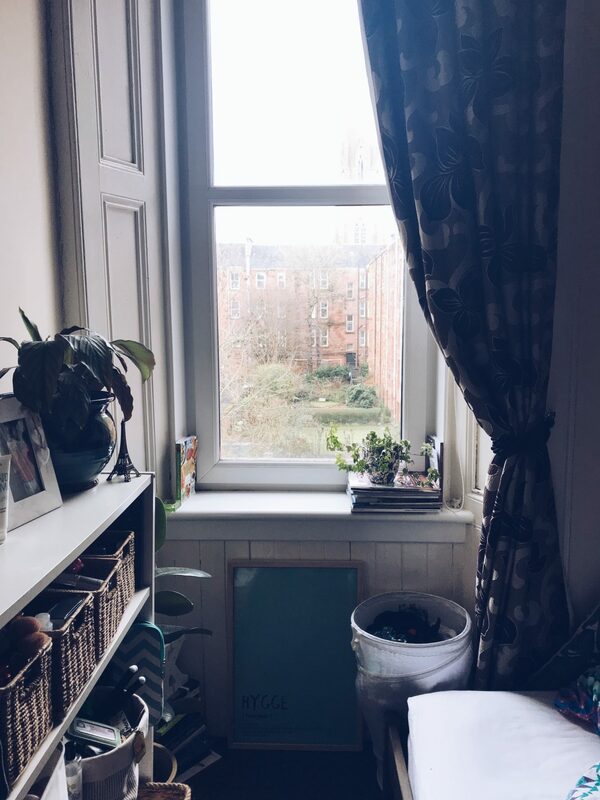 I say tiny quite sparingly as it is not at all a box room and easily fits in plenty of furniture but it does feel quite cosy sometimes. If you are living (like me) in a shared apartment, you probably have all your clutter stored in your room. Try to arrange your furniture in a way that optimises floor space as this allows for you to bring in other methods of storage or display. By arranging the furniture to be next to the walls, it opens up the floor space. Having access to my window by not obstructing it also makes the room feel very light and open. I have easy access to my wardrobe, plenty of room for my desk chair and can create a bit of mess without it culminating in a full blown bomb site. Whilst adding in bits of furniture doesn’t seem like the best way to create more space, you could be wrong. 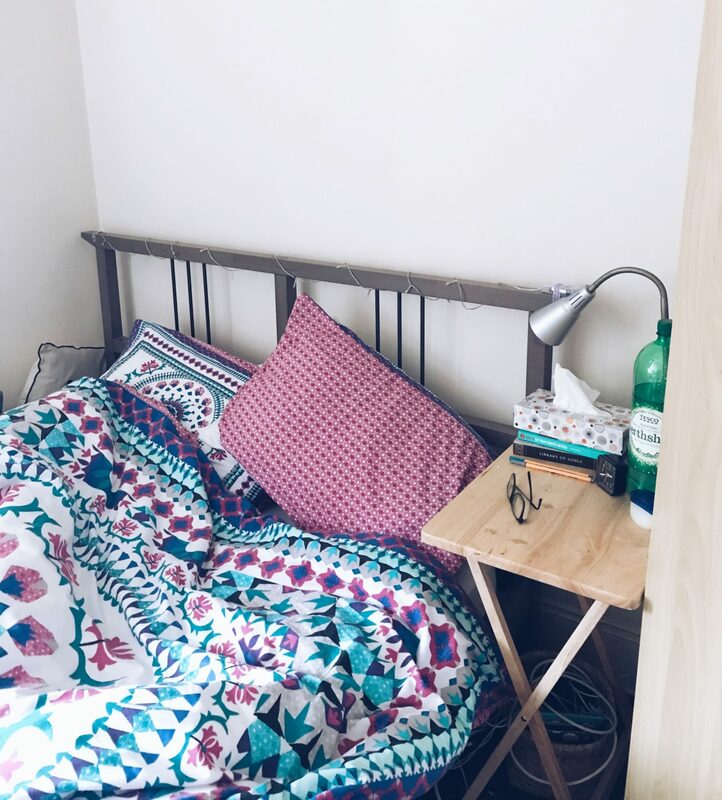 I’ve pushed my bed as far up to the wall as possible and instead of using the chunky beside table provided, I’ve substituted it for a slim table from B&M Bargains that fits in the gap between the wall and my bed. This gives me another surface and I’ve stored the other bedside table which has two drawers under my desk to use as desk storage. 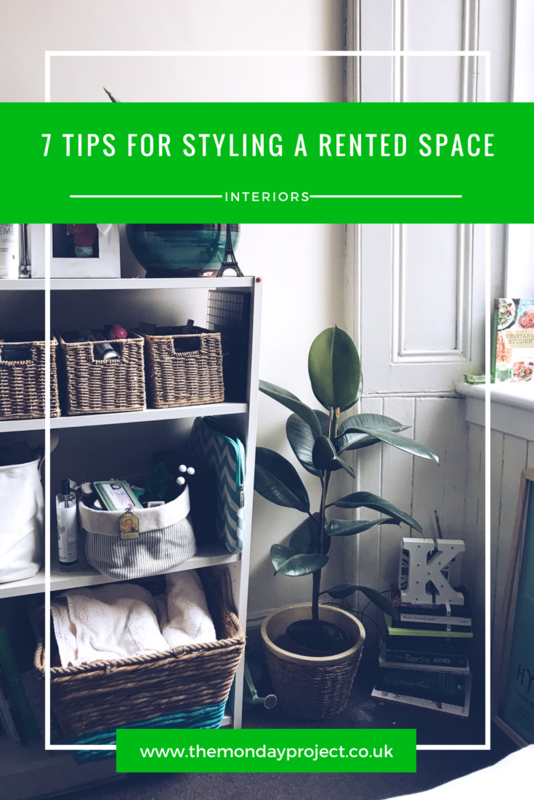 As I’ve said, you probably have to keep most of your belongings in this one room if you are in a shared rental. This might not be a problem if don’t keep a lot of things but if you are a fellow clutter hoarder like yours truly, it can feel a bit crowded in there. Under the bed storage is always a great place to start – think keeping towels, linen, seasonal clothes you don’t need, suitcases under your bed. You can buy under bed storage like this from Amazon or just use slim boxes like this from Hema. Storage wise, I tend to gravitate towards baskets. They add a real sense of character and feeling to a space. My bookcase isn’t used just for books and I keep most of my beauty/hair products in here as I lack a dressing table or a bathroom to clutter with my things. 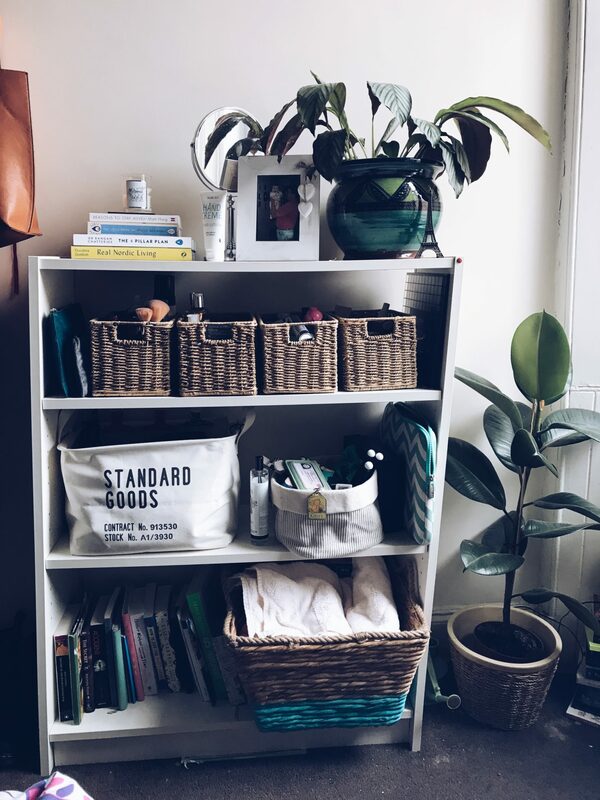 Shops like H&M Home, TK Maxx and Hema have great supplies of storage baskets and I personally have a few from H&M Home and one larger one from TK Maxx. Storing things on top of your wardrobe is also another space to take into account. I keep a small suitcase and a couple of colourful bags to store in things like a blow up mattress, cushions and blankets. 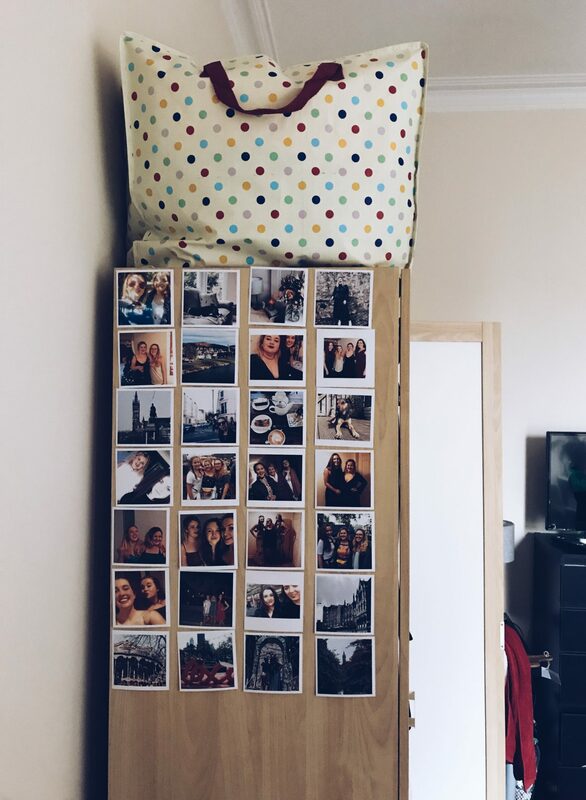 It might not be the most Insta chic way to store your things but hey, when space is limited, don’t ignore this great space that will never get in your way. If you don’t like clutter, this tip isn’t for you but those of who don’t mind a pile of books stacked places, stack away with my friends. One of the things I hate the most about the furniture in this room is the stupid corner desk. Why does it have to be such a colossal, awkward size? What is wrong with an ordinary desk? And ugh why does it have to be black? Moving aside from all the negativity, it is useful for storage. I keep a lot of books on here as I’ve run out of space on the bookcase, plants, stationery items, candles and lamps. As well as all the junk I heap on it daily. I also keep some ‘coffee table’ books on top of my bookcase with another plant, candles and a picture. You can display your ‘nice things’ and play around with them to get the look you want. The window sill is also your friend. I keep a pile of interiors magazines, a plant, a vase which sometimes has flowers in it and my incense holder. It is quite frustrating having to move things off it when I open the window wide but it is an extra space so don’t ignore. I’m a firm believer that adding some greenery will spruce up any space. It makes it feel a more natural, a living space. 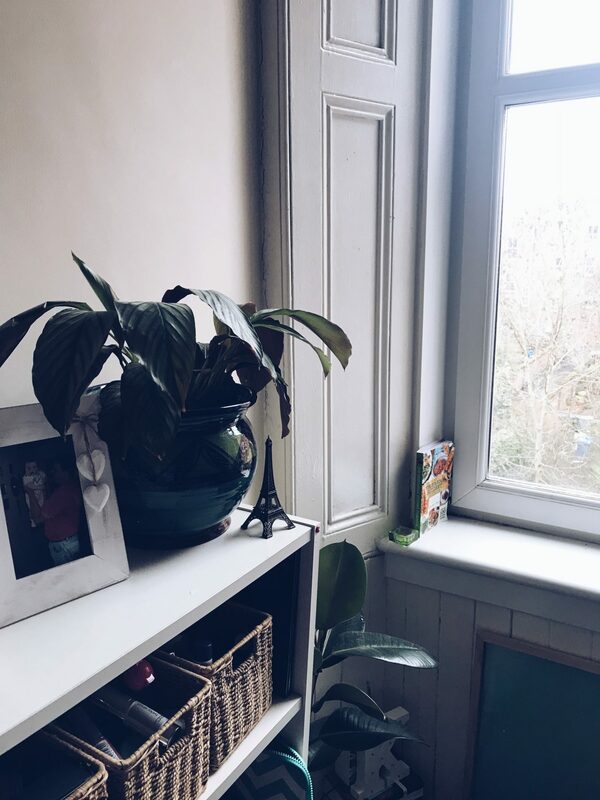 Whilst they can be tricky to keep alive, you will not regret adding plants to your room. I’m continuously adding plants to my room as you can never have enough. Allie of Rush & Teal has the dreamiest plant set up in her home which you can see on her Instagram. They are a pretty inexpensive way to add to your decor. They will instantly freshen up a space but won’t break the bank. I got my rubber plant in Lidl for £4.99. £4.99! Plant pots also inject your personality or the interior style you want to embrace. I migrate towards anything botanical or green or basket inspired as that is the kind of style I want to project. One of the worst things above living in a rental is you are often not allowed to nail things to the wall. At home I am always banging on nails, hanging up another print or five to curate my gallery wall. Prints are one of the nicest ways to make a home feel a home as it adds your personality and embraces your style. You just have to think outside the box. I’ve started stacking prints on the floor in front of the window. I’ve previously done this with my radiator, my bookcase and chest of drawers as an alternative way of displaying them. Washi tape is also a godsend – capable of holding a lot of weight and doesn’t leave a mark on the walls if you peel it off slowly and carefully as opposed to blue tac. Another super easy to to display cute prints and photographs is a pin board. I have a cork one but I have been lusting over this metal grid from Urban Outfitters. You can stick anything up on them and make them as unique to your style as you wish – it is literally a blank canvas. A recent blog collaboration with Printiki resulted in me having 30 photographs that I wanted to display. Buying 30 frames would have been impractical (where would I hang them?) and expensive (do not have the kind of cash to drop guys) so instead I stuck them all up on the end of my wardrobe with blue tac. Perhaps it is childish but I love seeing this from my bed. The loveliest part of any home is the soft furnishings, in my humblest of opinions. Most rental rooms and furniture can be drab so having a brightly coloured duvet or something crisp and clean can make all the difference. Primark is my failsafe for soft furnishings – all of the duvet covers, sheets and pillowcases in my flat are from there. They are incredibly good quality for the price and they have a vast range so something to suit every style. Cushions and throws also add a bit more warmth and personality to space. Often you’ll be left with beige walls so adding a splash of colour via a blanket or throw is a great way to do this. 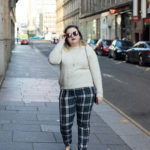 I have a couple of gorgeous fluffy blankets from TJ Hughes that I picked up as part of an autumn room makeover and in the summer I drift more towards a green chequered throw from Sainsbury’s that reminds me of a picnic blanket. Anything personalised adds a stamp to your space so I have a ‘K’ cushion also from TJ Hughes as well as a couple of grey ones from Primark. As we don’t have a living room, my bedroom is often where I’ll host guests so we’ll sit on my bed so cushions add more personality and give it more studio flat feel (lol) than bedroom. The biggest tool at your disposal when spicing up your bedroom and making a rented space feel like yours is adding your personality into it. I hate the furniture in my room – the black IKEA style is not mine but I’ve made my space mine by injecting me into it. 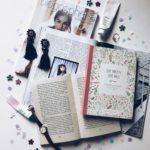 I’m an avid reader so I have books & magazines everywhere – the bookcase, my desk, bedside table, window sill. I have photographs of me, my friends, family and life stuck up. I have lots of stationery on my desk. Notebooks piled up. Beauty products on display. These are all things that represent me so by displaying them in my room, I’m really making it mine.